Covering 114 miles (180km) and taking in eight major climbs with 3950M (12,959 feet) worth of climbing, the Fred Whitton Challenge is arguably the toughest sportive in the UK. This Sunday I rode the event, courtesy of the team at Saddleback, who sponsor the event. Castelli Body Paint Bib Shorts. Loving those. A limited edition Saddleback Castelli official Fred Whitton Ride Jersey. Loads of people commented on this on the ride as it has all the climbs on the rear. A pair of Vredstein Fortezza Tricomp tyres - very nice. A box of For Goodness Shake post-ride recovery product. As many gels and bars as you could scoff supplied by Mule. According to the entry list 1,413 riders had their names down to start. 1,126 finished. According to my maths, that means 20% of people (1 in 5) didn't finish the course. That's how tough it is. The fastest rider completed the course in 6hrs and 5 mins. God only knows how. Longest time was 12hrs and 26 mins. Time for me was irrelevant. Finishing was what it was all about. I've broken the review down into bullets as there is so much to get through. It's taken me about 20 mins to explain the whole ride anytime someone has asked me verbally, so hopefully this will be easier to digest. Good route information on the website. High quality colour brochure mailed before the event with car parking info, visuals of the route. Website has plenty of information on it. Registration was quick and easy. Electronic timers issued. Note that they do not deduct time spent on stops. Plenty of people on hand. No waiting for anything. Two feed stations. Buttermere at 52M. Calder Bridge 87M. Well stocked. Jam sandwiches, cake, squash, water, bananas etc. Worth noting that the first 52 miles you need to carry enough food with you to get you through and use fluid sparingly. There are shops en route to stop and buy water to top up, which I did. Post-ride. Pasties, cake. Massage for a fiver. Certificates to buy etc. 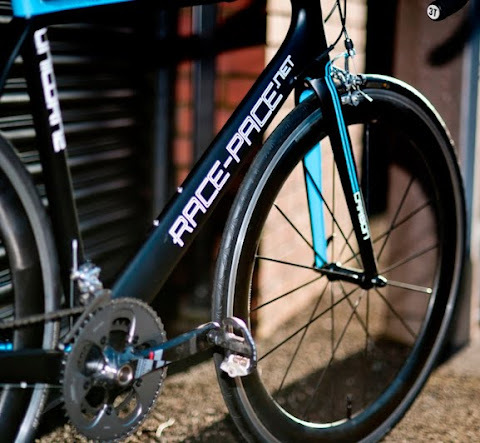 Race timing printed on the spot. Support. Loads of locals out on the roads, giving you a friendly clap. Real boost when you're suffering. Vehicles all bibbing horns and stuff. Up at 4am to drive up to Coniston. Got to site about 6am. Had something to eat, set the bike up. Registered. Went to see the lads at Saddleback. 7am departed. I'd figured out this was my optimum time to meet the 1pm cut deadline at the top of Honister. Planned a 12.5mph ride average to get me through with a little time to spare. 0.5M into the ride you hit the first climb - my chain snapped. Walked back to the start, chain in hand. Spanners from Saddleback set to work getting me fixed back up. The delay cost me 30 mins. Unfortunately the timing chip couldn't be re-set, so my end time (exc. stops) is over-stated by this amount in the results. Weather was chronic. Driving rain setting off. The stuff that just lashes at you. Soaked to the skin in minutes, it was a very wet first 52 miles. At the feed stop, everyone was cold and space blankets were being handed out by the paramedics. It was miserable, but warmer on the bike, as you're body heat kept you going. During the afternoon we also had hailstones, bright sunshine and an almighty thunderstorm all thrown in. Insult to injury was a final battering from the rain four miles from the finish, got absolutely drenched (again). What to Wear. This was difficult to call but I went with: - Full length bib shorts. Overshoes. Base layer. Short sleeved thermal vest. Race Jersey. Light waterproof. Light gloves. Overgloves. Merino arm warmers. Neck snood. I'm glad I did as this combination allowed me to strip down when it warmed up and wrap up when it lashed down. Despite all of this, the conditions were so severe I was soaked to the skin for most of the ride. Food and Drink. I took a stack of gels and bars with me and powder to make up about eight bottles. I'm glad I did. The sheer exertion meant I was burning carbs like no-ones business. Regular eating on the bike was essential to keep energy levels going. Gearing. 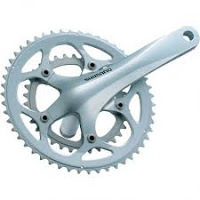 I rode my triple with a 12-28 rear cassette. I posted about gearing recently. This gave me a ratio of 1.071. Thank heavens I did. I was in that gear for nearly every climb - spinning away. My mission - to finish. Garmin Edge 800. Heart rate monitor and cadence sensor didn't work. Unit froze after seven miles, so ride data was kaputt. Making the cut. My front end technical meant my time window had severely narrowed to make the cut at the top of Whinlatter. I had a full on wind in my face for the first 50 miles and was riding on my own, so no-one to share the load with. Arriving at the bottom of Whinlatter I could see it was tight. I gave it everything up the climb and arrived exactly at 1pm to dib in. The first 61.6 miles had taken me just shy of 5 hours (30 mins for the food stop). I pushed on and made the cut at the second feed station following another 2 hours and 13 minutes in the saddle (25 miles). Fell off twice. No big dramas. Ascents were so steep, greasy road, granny gear engaged, out the saddle. Result = no traction and over we go. Just a bit of bruised pride. Ascents. There are eight of them in total. With a load of smaller ones chucked in for good measure. Kirkstone (454M), Matterdale End (343M), Honister (356M), Newlands (333M), Whinlatter (318M), Cold Fell (295M), Hardknott (393M) and Wrynose (393M). Only for the hardiest of climbers, some were really long drags, some short and sharp. Hardknott (see picture) was the toughest of the day for me. Starting off at 25%, then to 30% in parts, and so long. Trust me, Mow Cop of the Cheshire Cat was nothing compared to this. Hardknott. This is where it all went wrong for me. It arrives at the 101 mile point. At this stage, I was shattered. Legs were tired, already done about 9k climbing. Hit the very steep bottom (25%) and bang, I was off. Bike went from under me. I couldn't get back on and clipped in so I ended up walking up nearly all of Hardknott in my socks to protect my cleats. I have to be honest, I had nothing in the tank at that point, so no excuses, I was walking it, not riding it, fall or not. It is one hell of an awesome hill. There were more people walking up it, than riding up it when I went up (the tail enders). Chapeau to everyone that road up that hill. It was relentless. Hitting the top, a huge thunderstorm broke out, more rain and another drubbing. Mentally, it was very tough at this point, there was still one more climb to come, I was alone, it was cold and the rain was relentless. Wrynose came soon after that. At this point, I was running on fumes. I gave it everything to get up. 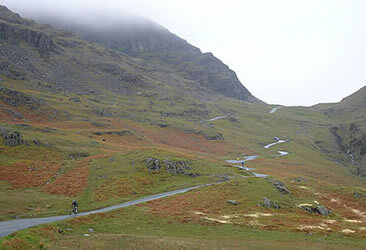 Nowhere near as hard as Hardknott, bit more of a drag ,but still around 1200 feet of pain. Rolling over Wrynose you're about eight miles from the line. Couple of little drags - just to make a final point - before you roll into the finish. The smallest ascent felt like a 1 in 4 at this point. Descents. The poor conditions meant the roads were slippery and some of the descents were really fast and highly technical, plus potentially very dangerous. Four major crashes were reported on the day. You had to be on the brakes all the way down. If you didn't you were slingshotted to a rapid speed. Thrilling, but real restraint needed in the poor conditions as the brakepads were so wet. I'd love to go down some of them on a dry day, they were absolutely thrilling and a real highlight after some tough climbs. My time. According to my official print out it is 11 hours 45 minutes. So, knock off 30 mins for the mechanical and another 45 minutes for stops, that makes it around 10hrs and 30 minutes in the saddle. It's the hardest ride I've ever done, bar none. I didn't set a time to finish within, my objective was to just finish, whatever it took. When I first started road cycling, hills were my enigma. I avoided them, turning to easier flat routes. I was always last up them on the club rides and I hated them. I'm 6'3" tall and weigh 210Ibs. I'm not built to rocket up hills, but I can't half rocket down them. Riding the Fred Whitton Challenge was all about challenging myself, seeing what my limits were and defeating those hills. I rode up seven of the eight hills and crossed the line, which was my objective. One day, I'll have to go back to Hardknott and have another go. I could do it if I turned up with no miles in the legs I'm sure, it's the previous 101 miles that made this a really difficult climb as you've depleted so much energy getting to this point. Gearing was everything. Taking my old faithful Specialized with a triple front and 12-28 rear cassette made the difference to me finishing or not finishing. My aerobic engine was working well and this meant I could sit and spin the low gears. That was my strategy, try and stay as fresh as possible for as long as possible - it worked for me. Big Chapeau to the guys running 39/25 ratio on those climbs. Attitude means altitude. At points on that ride, my metal was being severely tested. Andy Tennant said to me on a recent ride about "concrete pills" - you need to take them if you want to make it as a pro. It's a metaphor for being able to really keep going, when your body is telling you to give in. The wind, the rain, the relentless hills. I kept going, gritted my teeth and just dug in. 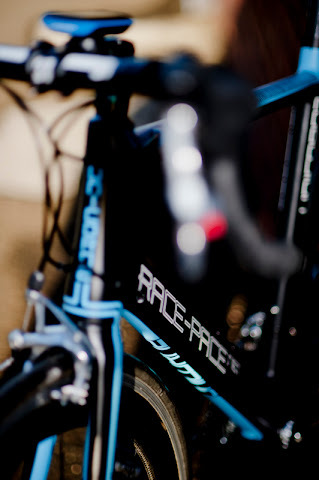 A real mental test of how much suffering you're prepared to take - "Put me back on the bike." If I can do it, so can you. 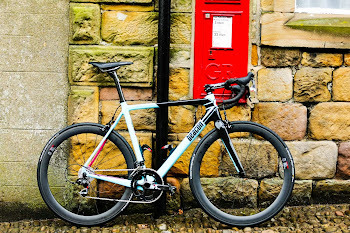 Cycling for me is not about being the fastest, it's about my personal enjoyment, my physical and mental health, and the hobby element such as this blog. Less than two years ago, I'd not ridden more than ten miles in a bike in the previous twenty years. Here I am now riding one of the toughest sportives in the country. I've still plenty of capacity to improve, it takes time. Plenty of people will pass you, but one day, you'll be one of those people. Just keep riding and keep trying. A rollercoaster day in many ways for me, but feel that I may have put a single stripe on my cycling top which others may give a knowing nod too. If you ever get a chance to do this ride, then I'd recommend you try it. You'll surprise yourself what you're capable of it you push yourself. Great post Phil, huge congratulations on getting round. You're a glutton for punishment Phil, I knew before I read it the granny would be out. Nice piece well written, should give others encouragement - but I won't be doing it! Wow sounds like one hell of a day out but congrats for getting through it!! Good effort Phil and I think you have probably earned your stripes. Looks like all the comments from one of your previous posts offering good advice were just about right. I think we have all probably been in your shoes at some point and it is nothing short of purgatory while you are doing it but the sense of well being when you finish is priceless. All the money in the world can't buy days like that in the saddle. Good stuff Phil, hope the weather will be a bit warmer for you next time. What's next on the list of pain? 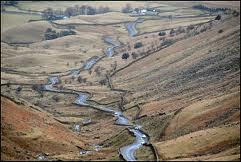 Next long one day ride for me is the Lakes to Manchester leg of the Ride Across Britain on the 15/6. Anything else will feel flat in comparison!! Just wanted to say well done, thats a great achievement. I am mighty impressed!! Great effort Phil. My knees are aching just reading this! Well done on that ride. The weather can be awfull in that neck of the woods and I know Whinlatter, hats off to you :). An inspiring report to all of us pedal pushers who just dream of doing what you achieved..perhaps it IS possible after all. Well Done! Awesome write up. I did the Fred in 2011 and then again in 2014. The second time around I approached it in a more sedate manner, rather than racing I paced and ate loads, got my gearing sorted and climbed most but not all of the climbs, I may have to go back to beat Hardknott but I was overjoyed with how well I did. 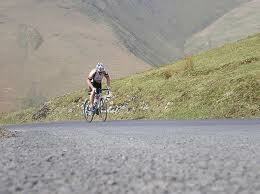 You sound very much like me, I'm 6'1 and 14 stone, (Clydesdale) but I can still get up the big climbs. I heard a joke once about 2 bulls going down a hill and saying 'hello' to the cows at the bottom and this refers very much to how you need to approach the Fred. Great write-up and great encouragement to others to try the Fred, I'm gonna go back for Hardknott and do IT!!!! Having read this,I think this might be a challenge for next year....!! Great write up. And I know it's 6 years ago but a congratulations is still in order so very well done. Max kudos. I'm entering the Fred for the first time this Sunday. 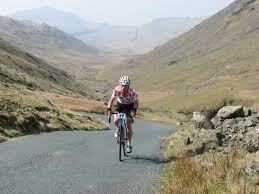 I ride in the Ribble valley but saying that most I have done in training is 8000ft. I'm so looking forward to the challenge. It's going to be tough but a night in bowness and a pint afterward will spur me on.